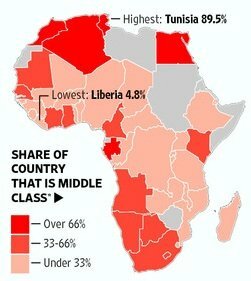 34%, or 313 million Africans are now middle class (living on $2-$20 a day), after several decades without any change, a jump from 27% in 2000. The Asia Development Bank published a similar report last year saying that 56% of the Asian population is living on $2 – $20 a day (PDF). This calls into question the definition of middle class. I consider myself middle class in the United States of America and my family has been characterized as middle class ever since I can remember. However, my family and I definitely live on more than $20 per day and I would never imagine being able to call myself middle class based on how much money I spend in a day. Its all about location. Here in the US, the term middle class is synonymous with the “American Dream.” It is not so much a hard and fast economic development term that we can use to compare ourselves with other countries, but rather a socio-cultural term that is used to compare ourselves to each other in our attainment of the “American Dream” (Western notions of success). the middle classes are: likely to be less connected to agriculture; more likely to be engaged in small business activities; and benefit from formal sector employment, with a weekly or monthly salary, which enables them to adopt a longer-term perspective towards their finances. Even with a more economic definition, nothing about the term middle class is set in stone and it varies widely between communities and countries (more economic definitions of middle class). The Guardian continued to note that $2 is the poverty line for most countries, so if you live on more than that you are middle class, but there is no in-between. This only continues to prove that “middle class” cannot be defined by economists or development pundits. If we look closer at the term in the United States, it has always been a fluid and flexible term that a wide range of the population wanted to use. The majority of Americans call themselves “middle class” even when many fall into “working” or “upper” class categories based on their income levels. Middle class often means achieving higher education, holding a professional job position, owning a home, and having a well established lifestyle that is socially acceptable. All of these status symbols mean something different across culture and country of origin. Populations bend and shape their definition of being “in-between” poor and more well off by different standards that are generally unwritten. If we use the United States as an example again, the Pew Research Center conducted a study on social and demographic trends to find that there isn’t just one middle class in America, but four! The study found that people often held onto definitions of middle class that defied traditional stereotypes. In conclusion, we are all middle class. Whether we want to call ourselves middle class or we truly fit the economic definition, the majority of individuals around the globe identify themselves in the middle class. There is a global middle class that has no financial boundaries, but rather includes all individuals who seek advancement, education, and something more than what they currently have. Economists and development pundits cannot create a definition of middle class for a continent let alone a country, nor can they compare the middle class of the USA to that of another country or especially a continent. If we want to truly understand if 1 in 3 Africans are middle class, then there needs to be some serious work that includes understandings of success in various countries and asks a large segment of a country’s population how they identify their socio-economic status based on their cultural norms. Why tell someone that their success isn’t as important as another’s?